Jean Briese has been honored as Arizona’s highest ranked motivational speaker and business coach. Prior to starting her own business, Jean spent 25 years leading successful sales teams in corporate American. Jean started her speech by sharing a story from her childhood. She was the oldest of 4 raised by a single mother who left her children two weeks before Christmas when Jean was 15 years old and the youngest sibling was only 5 years old. 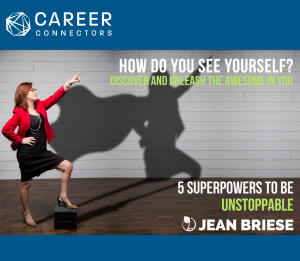 Through these painful early life lessons, Jean developed the superpowers necessary for success. Jean looked at behaviors of top performers in various fields. One of which was Michael Phelps, the most decorated Olympian in history. He doesn’t believe in can’t and will not even think or say the word can’t. Instead he envisions himself successful and overcomes obstacles. Each of us has a set of talents and gifts. Stop to think about who you are and what makes you special. No one has the same gifts, experiences, and knowledge as you do. Look to your passions. A strategy Jean recommended is to send out an email asking friends and colleagues to list 3 of your strengths and 1 weakness. Then pick 1 strength and make yourself amazing at it. A negative mind will never give you a positive life. Jean spoke about her negative feeling about not having a college degree, but she turned that negative self-doubt around and said I have everything I need for success. We rise and fall to the level of our relationships. Some people are blessings and some people are lessons. Try and surround yourself with positive people. Ask yourself these questions and work on your answers. How should I add people to my circle? Do I have a mentor? Fear is the number 1 reason we don’t take action. It’s important to remember one must fail first to accomplish anything. A recommendation Jean had for the group was to commit to one idea by putting it on your calendar and doing it within the next 24 hours. Jean concluded her remarks by reminding us, THE TIME IS NOW. Career Evolutions a recruiting agency that opened its doors during one of our countries’ worst recessions in November of 2008. The company has thrived in large part due to their understanding of how to brand the job seeker properly and knowledge of the ever-changing job market. Treat the search like a job. Have a dynamic relevant resume. Manage your personal and professional brand. Don’t talk about salary too early. Mosaic makes it simple to go solar by leveraging technology and financial innovation, with a goal of providing access to clean energy for everyone. Established in 1928 Farmers Insurance has been an innovative leader providing care and assistance when help is needed the most. Farmer Insurance offers an extensive array of coverage options. They have been recognized as a leading insurer for small and mid size businesses. Due to the companies ongoing success Farmers Insurance will be hiring an additional 1000 employees to work in their North Phoenix office. Do a financial reality check, which entails creating a spending plan- for example, the everyday extras like a cup of coffee from Starbucks may no longer be in your budget. Create additional income sources, such as freelance work and part-time work. Manage your debt. If you have credit card debt, call the credit card company and explain your situation and discuss your options with them. Also remember to stop using cards. Maintain proper insurance coverage such as medical, life, car and homeowners insurance. Ask for help from a trusted advisor. The University’s Mission Statement is to bring opportunities in the technology field to the masses. WozU has a passion for education. For a career in technology, students will learn different computer languages such as Java, .NET, Ruby on Rails as well as Data Science and Cyber Security. If you are transitioning in your career and wish to learn more about technology, contact a representative at WozU for additional information. They provide career services support. Jessica Pierce wrapped up the meeting by reminding the group to visit the Career Connectors website at https://careerconnectors.org for additional information on upcoming meetings, support tools and event recaps. She went on to thank our wonderful host Highlands Church for their support, as well as, all our amazing corporate sponsors and volunteers. Also, Jessica spoke about upcoming events. The next meeting will be held on January 10th, 9 am at the Phoenix location of Grand Canyon University – 5115 N 27th Ave, Phoenix, AZ. Please remember to sign up online for our next meeting. Seasons Greetings! I will end our last blog of 2018 with a quote from Laird Hamilton. “Make sure your worst enemy doesn’t live between your two ears.” Stay positive! 2019 will be an amazing year. Great lead for follow up with a couple of employers.